This post sponsored by Barn Light Electric Company. All opinions are my own. And on the 3rd day, Barn Light said, Let there be light: and there was light. Okay, that’s a loose interpretation, but it’s kind of close, right? 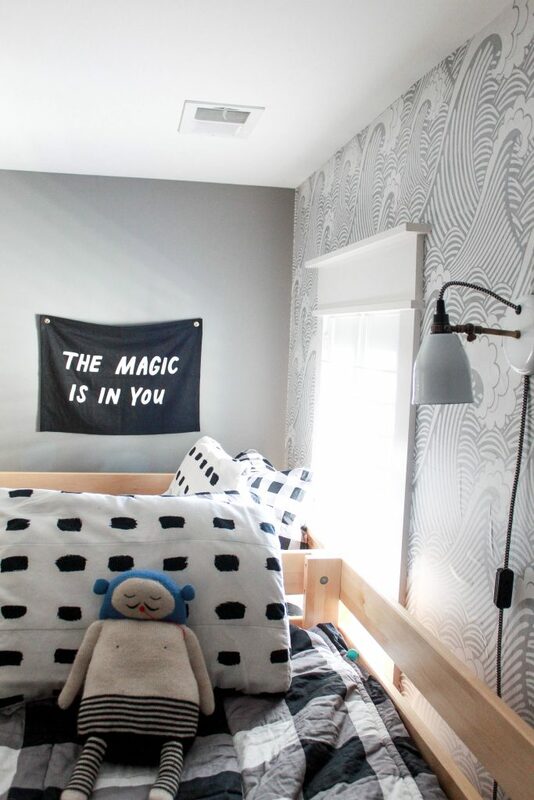 😉 If there was one thing that we needed to make happen in the boys’ bedroom update it was to add additional sources of light in there to brighten things up. 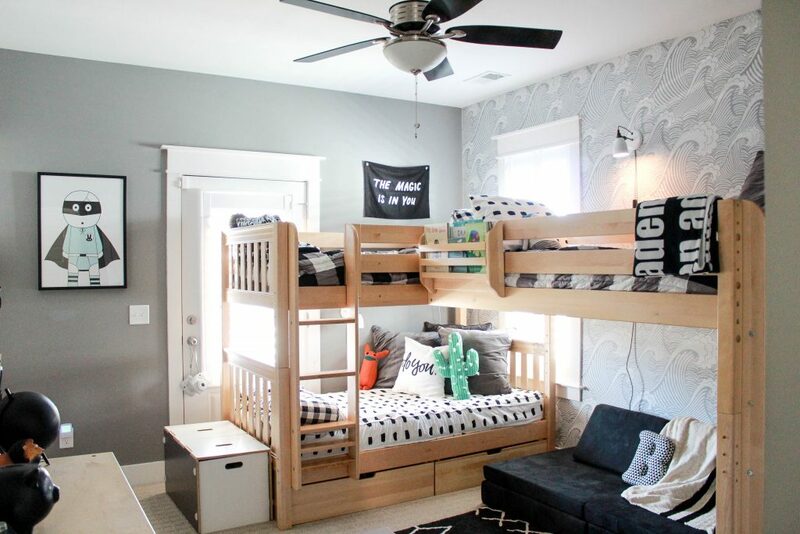 Adding a triple bunk to the already small space meant blocking a window or two, so lighting became of critical importance. The boys also like to relax in bed at night and needed reading lights that would give them just the right amount of glow and wouldn’t disturb the other one from falling asleep. I really wanted to make sure that we were able to position the lights close to them, so they weren’t getting in and out of bed during the night to turn the light on and off. When I came across these pendant lights on Barn Light’s website, I knew they were the perfect fit for what we needed. 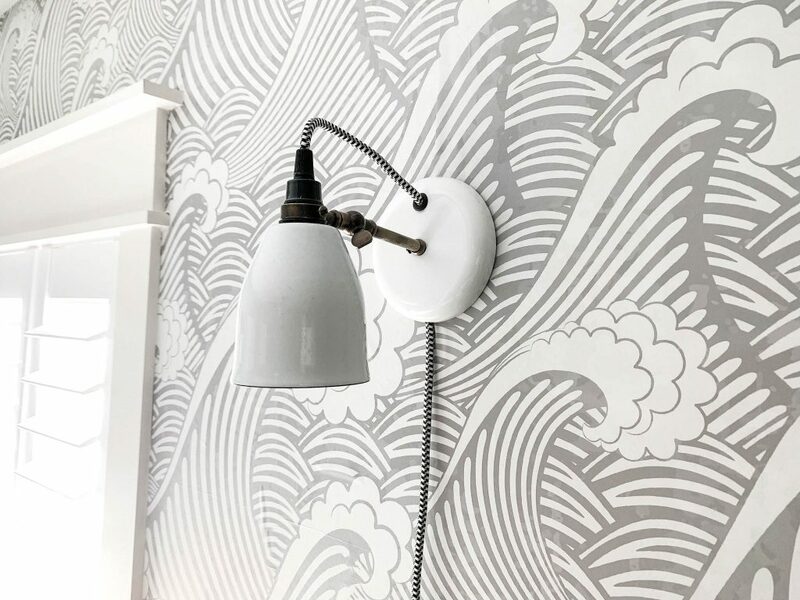 The best part is that the Lovell plug-in wall sconce was also completely customizable, so I could pick the colors and finish right down to the cord. How cool is that?! Let’s take a closer look at how we did it…. I wanted a light for each boy, so I went back and forth on where to place them. Luck would have it, the boys decided to split up, so we have one boy on the top bunk and one on the bottom. This made it easy for me when installing the lights, since I had to consider outlet placement and a wall stud for hanging. 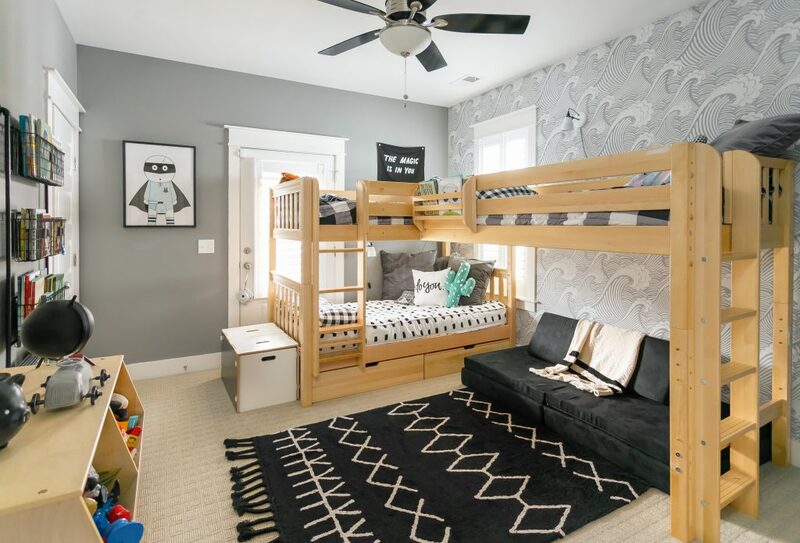 I was able to put one right above the top bunks that shines enough warm light to both beds, and run the cord down the wall to the outlet tucked behind their Nugget sofa. The second light I positioned near the bottom bunk, that was technically meant to be a “hang-out” space rather than a sleeping arrangement, but Aden had other plans and claimed that one for himself. It works out either way, so I was able to install it still within arms reach and have the cord run down to the outlet hidden behind the bed mattress. Install took less than 10 minutes each and believe it or not, I was able to do it myself. WIN! The quality on these lights are top notch, so I know they’ll be with the boys for years to come. Each one was hand-spun and made especially for them, again because they were customized with the colors and finishes we wanted. We chose 200-white for both the shade and backplate, weathered brass for the arm finish, and black & white cloth for the cord. 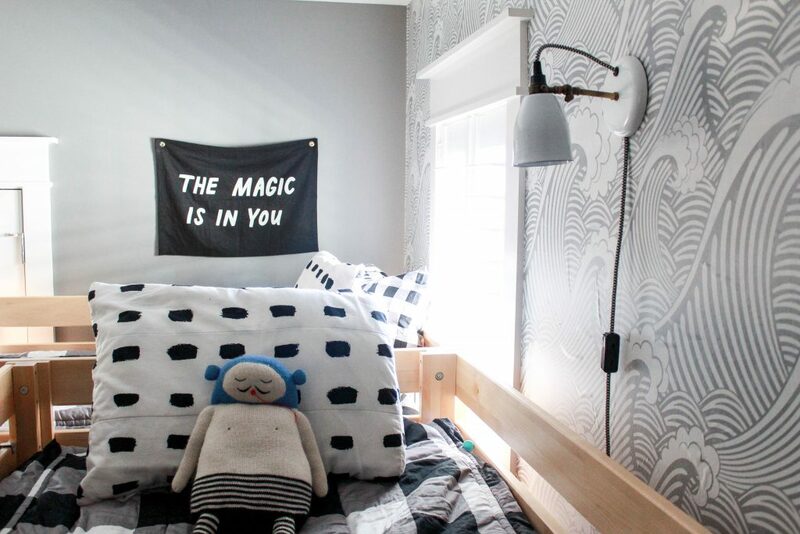 I wanted it to coordinate with the rest of the room and pop off the dark paint color on their walls. I couldn’t be happier with how much personality they added to this space! They really completed the whole look of this room. 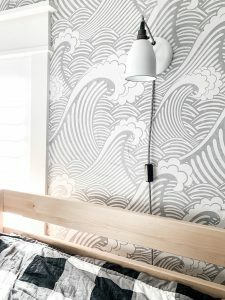 If you’re looking for a quick little update, the first thing you should definitely consider is adding in some unique light fixtures. 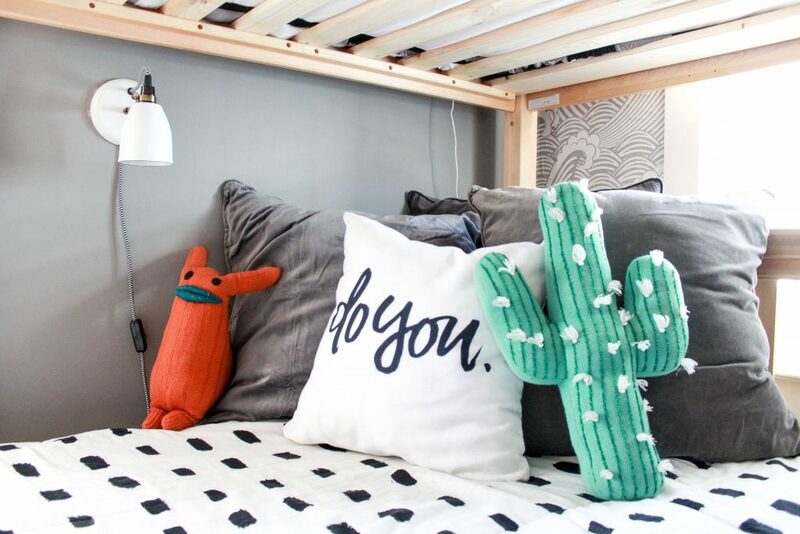 It’s such an easy and fantastic way to quickly change the look of your space. I love how this turned out for the boys. What do you think? I was given product from the BarnLight company in exchange for this post. As always, all opinions are 100% honest and completely my own.